Formulation: Liquid. In 50mM TRIS-HCl, pH 8.0, containing 50mM sodium chloride. 2. Investigation of polyubiquitin chain recognition by and interaction with ubiquitin binding proteins. In addition to lysine-linked polyubiquitin chains, the amino terminus of ubiquitin can be used to form head-to-tail polyubiquitin chains, in which the C-terminal Gly of one ubiquitin is conjugated to the N-terminal Met of an adjacent ubiquitin. Such linear polyubiquitin chains are structurally similar to Lys63-linked polyubiquitin, despite the chemical differences between the two linkage types. Several ubiquitin polygenes are encoded in eukaryotic cells and undergo post-translational processing to generate the cellular source of free ubiquitin monomers. However, linear polyubiquitin chains have been shown to be assembled in vitro by an E3 ligase complex, known as the linear ubiquitin chain assembly complex (LUBAC), and ubiquitin binding domains (UBDs) with a preference for linear polyubiquitin have been identified in a number of proteins. A possible role for linear polyubiquitin modification in NF-κB pathway activation, involving linear polyubiquitinylation of NEMO, has also been reported. 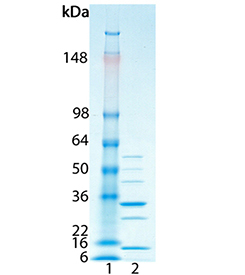 SDS-PAGE Analysis: Lane 1: MWM; Lane 2: 2.0 µg of purified Linear Polyubiquitin chains (Ub2-7) Prod. No. BML-UW1010.